A method for creating large graphene crystals in minutes instead of hours has been demonstrated by Oxford University researchers. The development is expected to pave the way for cost-effective high quality graphene production on a commercial scale. This would aid the development of new technologies in fields such as electronics and metrology, owing to graphene’s combination of strength, flexibility, electrical properties, and chemical resistance. The technique, from Professor Nicole Grobert of Oxford University’s Department of Materials, creates graphene crystals around 2-3 millimetres in size in just 15 minutes, compared to times of up to 19 hours when using current chemical vapour deposition (CVD) techniques. A scaled version could produce flakes of graphene in large wafer-sized sheets. A thin film of silica was deposited on a platinum foil which, when heated, reacts to create a layer of platinum silicide. 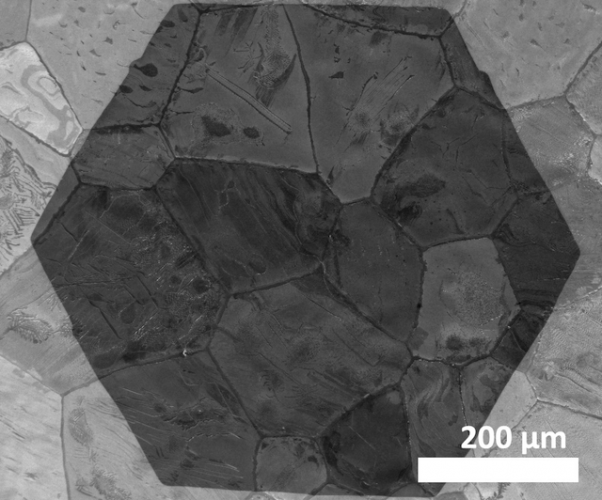 This melts at a lower temperature than either platinum or silica, creating a thin liquid layer that smooths out nanoscale valleys in the platinum. Carbon atoms in methane gas brushing over the surface then form large flakes of graphene. Using CVD with just platinum creates flakes of around 80 microns (0.08mm). But with the liquid layer of platinum silicide added, graphene crystals of 2-3 millimetres were produced in minutes. As the crystals grow naturally, the formation of grain boundaries that can adversely affect the mechanical and electrical properties of the material are avoided. ‘Although we demonstrated our methods for platinum foil, a substrate that costs around 15 times more than some of the alternatives, the possibility to reuse platinum or adapt our procedure to other cheaper metals can open up many possibilities for significant overall cost reduction,’ said Professor Grobert’s co-author, DPhil student Vitaliy Babenko. The team also think that with a thicker liquid layer to insulate it, the graphene might not have to be removed from the substrate before it can be used – a costly and time-consuming additional step required with all other methods.